Laurens Molina, Blake Leeper, David Prince, and Jeremy Campbell on London’s famous Abbey Road. Jeremy Campbell competing at the 2012 Endeavor Games. Lora Webster and Kari Miller at Buckingham Palace. Katy Sullivan in front of London’s iconic Tower Bridge. 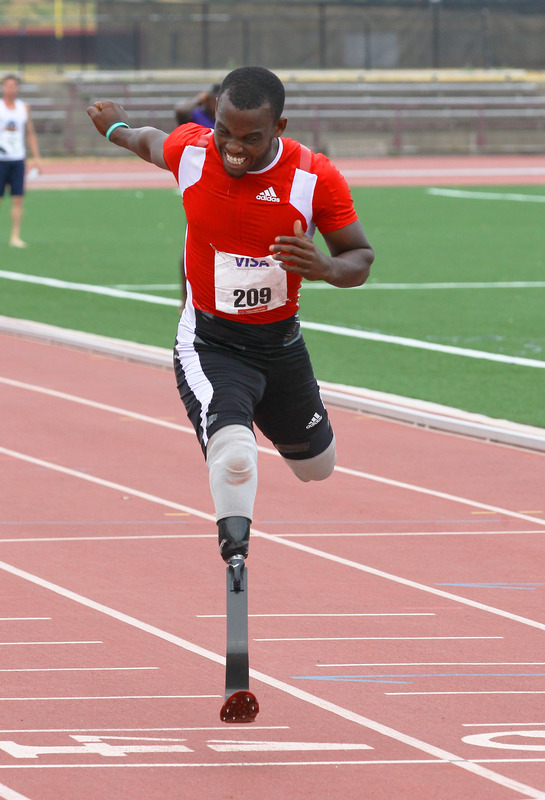 Blake Leeper finishing the 400 meter dash at the 2012 U.S. Trials in Indianapolis. David Prince competing in the 200 meter dash at the 2012 U.S. Trials in Indianapolis. Austin, Texas, September 13, 2012 – Congratulations to all of the Hanger Clinic athletes who competed in London; we at Hanger are very proud of you and your significant accomplishments! Jeremy Campbell set a new world record and won a gold medal with a discus throw of 60.05 meters. Blake Leeper earned a silver medal in the 400 meter dash, setting a U.S. record with a time of 50.14 seconds, and took home a bronze medal in the 200 meter competition with a time of 22.46 seconds. Kari Miller and Lora Webster both took home silver medals as part of the women’s sitting volleyball team. David Prince, with a time of 50.61 seconds in the 400 meter dash, brought home a new world record and a bronze medal. Katy Sullivan achieved a personal best in the 100 meter dash with a time of 17.33. Katy, a bilateral above-knee amputee, placed sixth in her race but beat unilateral above-knee amputee competitors. Bradley Johnson had a strong performance with the men’s sailing team despite weather challenges. Laurens Molina competed in the men’s marathon competition and finished with a time of 1:48:25. Maya Nakanishi finished 8th in women’s long jump with a distance of 4.79 meters / 15 feet 7 inches. The games started in London on August 29th and concluded September 9th, 2012. 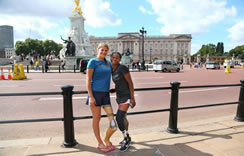 For more information on the Hanger Clinic amputee athletes who competed in London, visit: www.Hanger.com/London2012. News coverage and photos of the Hanger Clinic athletes are available at www.Facebook.com/HangerNews.